With an Italian twin-turbo 3.0-liter V6 available in two outputs, 350 and 410hp, buyers can get either a sedate GT or a proper howler of a sports sedan. Both base and S model Ghiblis get rear wheel drive as standard through an 8-speed automatic, though the Ghibli S Q4 gets all-wheel drive. A limited edition Ghibli Nerissimo Edition (450 worldwide) adds black 20-inch Urano alloys and black exterior trim, with the interior receiving black leather sports seats and red stitching. Optional safety features include blind spot monitoring with rear cross traffic alert, forward collision auto-braking and adaptive cruise control. What does the Maserati brand mean to you? Ever since it was established back in 1914, this Italian marque has undergone multiple transformations including ownership by Citroen, DeTomaso, and now Fiat Chrysler. At some points, Maserati was a racing brand, other times it built supercars and luxury models. 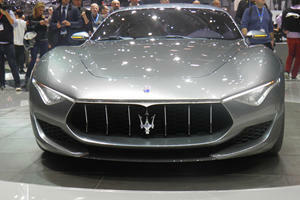 For the past several years, Maserati only sold two models - the GranTurismo sports car and the Quattroporte sedan. Both were more expensive than your average BMW or Mercedes, yet less expensive than an Aston Martin or Ferrari - the perfect luxury middle ground. Everything changed in 2013 when Maserati brought back the Ghibli. With its reintroduction, Maserati made a decision to stop being the ideal midpoint between German luxury automakers and high-priced exotics and produce cars on a larger scale. Maserati was now targeting customers from Audi, BMW, and Mercedes. So, has it worked? We decided to test a 2018 Ghibli GranLusso S Q4 to find out. So what exactly is a Maserati Ghibli? 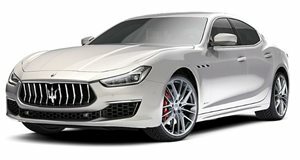 It is a mid-size luxury sedan which acts as the entry-level model in Maserati's lineup below the larger Quattroporte - it is larger than a BMW 3 Series but smaller than a 5 Series. In the United States, the Ghibli has been on sale since the 2014 model year but has undergone significant changes for the 2018 and 2019 model years. We should note 2019 models are already arriving in dealers but were not available for our test. When it first came out, because we didn't think the styling was special enough for a Maserati. For the 2018 facelift, Maserati made some subtle tweaks to the Ghibli's front fascia - it is a minor change but visually the impact is significant. Unfortunately, the same cannot be said of the rear. When the Ghibli first arrived on the road, I spotted one in a parking lot and went to go get a closer look. Much to my surprise, it wasn't a Ghibli. It was a Kia Cadenza. To this day, I have not been able to unsee the similarity between the Cadenza's taillights and the Ghibli's. This is either a massive compliment to Kia or an insult to Maserati. I never thought the Cadenza was an ugly car, so let's just call it a compliment to the Kia. Along with the restyled front end, and added new advanced safety features. In addition to the added power, Maserati also created two new trim levels - the GranLusso and GranSport. The GranLusso trim is meant to look softer and more luxurious while the GranSport is meant to look more aggressive and sporty. Thankfully, the 2019 update will also include a new shifter design because the one found in my 2018 test car was infuriating to use when shifting into reverse. Picking your desired output in a Ghibli is pretty simple because there are two different power levels to choose from. The base Ghibli is powered by a 3.0-liter twin-turbo V6 sending 345 horsepower and 369 lb-ft of torque out to the rear wheels through an eight-speed automatic transmission. 0-60 mph takes 5.5 seconds and the top speed is 166 mph. Even though the engine block traces its lineage back to a Chrysler Pentastar block, it is built in Italy by Ferrari and sounds better than many V8 engines, so do not fret about its pedigree. Stepping up to the Ghibli S brings the power to 424 hp and 428 lb-ft of torque (up from 404 hp and 406 lb-ft in the 2017 model). The 0-60 mph time is dropped down to 4.9 seconds and the top speed is upped to 178 mph. My test car was the Ghibli S Q4, which routes its power out to all-wheel-drive, dropping the 0-60 mph time to 4.7 seconds at the cost of the ability to do burnouts. Base Ghibli models see 17/24/19 mpg city/highway/combined while stepping up to the S or S Q4 lowers these figures by a fraction to 16/24/19 mpg city/highway/combined. Inside, the Ghibli displays what we'd refer to as a mixed bag of materials - the opulent craftsmanship of a Maserati combined with the frugal feel of a Chrysler product. Some of the Ghibli's interior bits are shared with other FCA vehicles - sometimes this works to perfection while other times it feels out of place. The infotainment, for instance, is a reskin of Chrysler's excellent 8.4-inch Uconnect infotainment system. It features Apple CarPlay and Android Auto compatibility as standard with easy-to-use touch controls and a handy control/volume knob. On my unofficial 'Could My Mother Figure This Out With No Instructions Test," the Ghibli would pass with flying colors. My only complaint with the system was a lack of physical buttons for a few controls such as ventilated seats and start-stop defeat. One area where the FCA parts sharing felt cheap was on the buttons and switches. Items such as the window and headlight switchgear are practically identical to what you'd find in a Chrysler Pacifica or Dodge Charger. Maserati does add a strip of chrome over the window stitches but I do wish some of the controls were more bespoke. Although some of the switchgear feels cheap, the Ghibli makes up for it with plenty of premium materials. The seats, in particular, are some of the best I've tested this year. I was completely sold on the Luxury Zegna Package, which used silk inserts on the seats and doors instead of full leather. Since my tester was a GranLusso trim, these seats feature both heating and ventilation. I wish more luxury automakers would experiment with materials other than leather or Alcantara and I have to give Maserati props for the use of silk as a premium, breathable material. Typically, I'm all for wacky paint and interior colors, though even I had to admit the red/black combo on my tester was a bit much. Most of my passengers loved the bold motif but some of the red plastic in the interior (like the seatbacks and rear cup holders) looked cheap. Speaking of cupholders, I have to take a moment to complain about the ones in the Ghibli. It may not be an understatement to say they are the worst cupholders I have tested - they are tiny, have no adjustable grips, and are essentially useless. Even though the cup holders aren't ideal, the Ghibli is far from an impractical vehicle. Rear legroom is 33.2 inches, which is smaller than a mid-size luxury option like the Audi A7, though rear headroom is a more generous 38.8 inches because the Ghibli doesn't have a sloping, coupe-like roofline. Trunk space is also pretty useful at 17.66 cubic feet, which is actually a bit more than a Porsche Panamera without the seats folded. If you need a bit more storage, the Ghibli's seats do fold down with a 60-40 split. Driving Impressions - What Is It Missing? When it comes to evaluating a Maserati, only three questions need be asked - does it look pretty, does it sound good, and does it drive well? The first question is very subjective but the second question is fairly simple. This engine was designed and built by Ferrari, something you're made aware of from the moment you push the starter button. I loved the soulful cracks and pops from the exhaust, though the cabin is a bit too quiet to hear them properly. 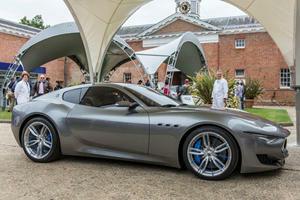 Roll down the double-paned glass windows and you'll be treated to a clearer performance of the Maserati V6 orchestra. As with the sound, driving the Ghibli is also a romantic experience. The steering has decent feedback, though I have to imagine the previous hydraulic system was a bit more communicative. Maserati switched to electric steering so it can implement more semi-autonomous driving systems, though I ended up turning many of them off because they were too aggressive in taking over steering control when I approached a painted line. If you're buying the Ghibli looking for a comfortable ride, you may want to look elsewhere. My GranLusso test model featured the non-adjustable suspension, which was simply too stiff. I with the Skyhook Sports suspension, which was far more compliant. Though it is a bit counterintuitive for the sports suspension to be softer than the base system, one benefit to the stiff suspension is extremely flat handling through corners. In the past, I have criticized Maserati for using a Chrysler-based V6 engine instead of the Ferrari-based V6 found in the Alfa Romeo Giulia. After driving the Ghibli, I recognize why this engine was the right choice for the job. The Alfa's 90 degree V6 is nowhere near as smooth and luxurious as Maserati's 60-degree V6. Plant your foot into the throttle and the Ghibli winds up with only a slight hint of turbo lag. Get the engine beyond 2,500 rpm and it's smooth sailing from there. The Q4 AWD system provides a trouble-free launch every time, though I did experience some awkward jerking while turning at slow speeds, which may be associated with the tires. One area where the Ghibli disappointed on the road was the ZF eight-speed automatic. Shifts were smooth, though they didn't feel particularly quick when I had the urge to drive fast. GranLusso models do not include paddle shifters on the wheel, so the only way to shift is to press the manual button and use the shifter on the center console. Maserati will sell you column-mounted aluminum paddle shifters on the GranLusso trim for a modest $550, so I highly suggest checking that box on the order sheet. In contrast, avoid the optional leather and wood steering wheel. Maserati places the wood around the entire circumference of the wheel, so it always sits in your hands no matter where you place them - it bothered me the entire time I was behind the wheel of the Ghibli. The wheel itself is also too thick for my preference and I much prefer the smaller, perforated leather unit found in the GranSport trim. Reliability with Italian cars is often a big concern for many consumers and during my week with the Ghibli, I noticed a few issues worth mentioning. My test car's brakes squealed at slow speeds almost every time I came to a stop. Luckily, the car is so quiet in the cabin, this phenomenon is barely noticeable with the windows rolled up and the radio on. My second issue came when I first started the Ghibli and proceeded to make my first slow turn. The tires made a chirping sound across the pavement as if they were losing grip. I initially believed there could be something wrong with the car's AWD system. After , I discovered the issue had been linked to the Pirelli P Zero tires, which can "skip" when they aren't up to temperature. Finally, on a more minor note, my test car had an errant stitch on the back of the steering wheel, which was sharp to the touch and placed right where I rested my finger. Yes, I know this is a minor complaint with a hand-stitched interior, though I have never seen this on any other luxury car I've tested. Pricing for the 2019 Ghibli has only increased slightly compared to the 2018 model. The base Ghibli starts at $74,980 while the Ghibli S starts at $79,980. For $5,000, the extra 79 hp and quicker 0-60 mph time are well worth the money. Unless you live in a cold climate where it snows frequently, I'd forgo the $82,480 Ghibli S Q4 model - the RWD model is more lively if you like to get the tail out every once in a while. On any Ghibli model, customers have a choice between the sporty GranSport trim and the luxurious GranLusso trim. 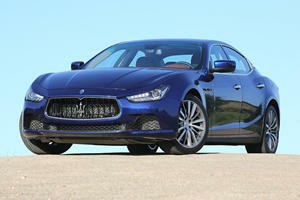 Both versions cost the same amount ($87,780 on the Ghibli S Q4) and feature similar options with a few distinctions. The GranLusso trim adds chrome front fascia inserts, full premium leather interior, heated and ventilated front seats, adaptive LED headlights with high beam assist, 10-speaker Harmon Kardon audio, and black brake calipers. The GranSport trim also includes the LED headlights and Harmon Kardon audio but differentiates itself with unique front and rear fascias, 20-inch wheels, red brake calipers, Skyhook adaptive suspension, 12-way sports seats, and a black leather steering wheel with paddle shifters. For 2019, Maserati has simplified its ordering process so it isn't as complicated to build a Ghibli. The Driver Assistance package is a steal at $1,590 for adaptive cruise control, a 360-degree camera, traffic sign recognition, forward collision warning, and highway assist. The Climate Package for $550 adds heated windshield washer nozzles, heated rear seats, and a rear sunblind. After and now the Ghibli GranLusso, I am split between which one I prefer. I adore the silk seats on the GranLusso, though the ride felt too stiff without the GranSport's Skyhook adaptive suspension. The lack of paddle shifters on the GranLusso trim was also a bit annoying, though $550 will fix the problem. If you can live with the ride, I'd say the GranLusso is the more complete package since the GranSport cannot be optioned with the silk interior. Here's exactly how I'd build it - a 2019 Ghibli S GranLusso with Blu Emozione paint and the brown Luxury Zegna interior package. Add on the Driver Assistance and Climate Packages, the upgraded Bowers and Wilkins audio ($1,990), and the aluminum paddle shifters ($550) for a total of $90,885. After sampling both the Maserati Levante and Ghibli, I found myself breaking my preference towards sedans over SUVs. Even though I almost always prefer sedans, I don't think you lose much driving feel when opting for the taller, more practical Levante. The Ghibli is a pleasant car to drive but competes in a highly competitive sedan market which includes several standout cars from Audi, BMW, Mercedes, and plenty of others. The Levante is far more unique in its segment, which is why it received a rating of Great Buy, even with the lesser 345-hp engine. The Ghibli, on the other hand, felt too stiff on the road and faces stiff competition from some of the best luxury sedans on the market. Maserati's 2018 facelift is significantly prettier and the car still sounds incredible, so the 2018 Maserati Ghibli S Q4 is still Worth A Look.